I learned to shoot when I was a Boy Scout. Later, I became a marksman when I served in the Civil Air Patrol, an auxiliary branch of the United States Air Force. 1) I stood up to the NRA, please donate to my campaign! 2) I stood up to those liberals that want to take away our guns, please donate to my campaign! The fault lies with our legislature. Bump stocks have been sold in Illinois for over six years. No one has acted to limit their sales. 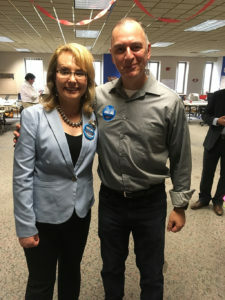 Enter Gabby Giffords, former congresswoman and victim of gun violence. The Giffords Law Center is THE clearing house for information on what each and every state, as well as our Federal Government, is doing regarding every single issue related to the 2nd Amendment. You may not know, but both Gabby Giffords and her husband, astronaut Mark Kelly, are gun owners. They don’t want to ban all guns, nor ownership of guns. They call for enacting sensible legislation, closing loopholes in criminal background checks for gun purchasers, limiting the sale of high capacity magazines, limiting the sale of assault weapons, and enforcing stiffer criminal penalties for straw purchasers and gun traffickers. They know that the problem is not the law-abiding gun owner. I stand with Gabby Giffords. I became aware of the “gun” issue when I was in second grade. I sat next to a girl, Anita Mehta, in school every day for two years. One morning, she stopped coming to school. Anita was shot and killed by a killer who was known to be mentally unstable. I wrote to my paper in the hopes of raising my concerns. The Chicago Tribune published my letter calling for legislators to do something. They never did. I am tired of waiting. I am tired of excuses. Hire me and let me put a bill up in my first week as your State Representative. I will get bump stocks banned. I will get the gun-show background-check loophole closed. I will enforce existing gun laws. No excuses.